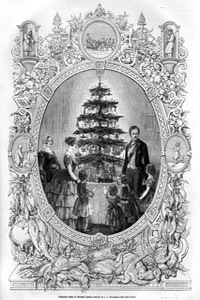 On 23 December 1848, The Illustrated London News published an engraving by J. L. Williams of Queen Victoria, Prince Albert and their five children gathered around a twinkling Christmas tree at Windsor Castle. The publication of the picture was to mark the defining moment for the Christmas tree and within a short few years, it had, despite Dickens dismissing it as, “the new German toy,” become a widely adopted and accepted part of festive celebrations in Britain. But the history of the Christmas tree stretches far further into previous centuries. Allow our timeline to take you on a pine-scented journey back in time. 1533 – There is a belief, particularly in Germany, that Martin Luther invented the custom. One Christmas Eve he was so apparently moved by a firmament of shining stars that he recreated the spectacle for his family by standing a young fir tree in their darkened house and placing candles on its branches. 1737 – A member of the University of Wittenberg describes a country lady who distributed little trees bearing lighted candles to children, together with gifts laid beneath them. Later in the century, Samuel Coleridge visited Germany and was intrigued by the delight his hosts took in their Christmas tree, which he described as, “a pleasing novelty”. 1820s – In the household of Queen Caroline, maligned consort of George IV, Germans set up Christmas trees bright with candles and hung with presents for English children of the palace. 1840 – A thriving market for pine-tops are sold at a market in Manchester by German immigrants. 1851 – Although Christmas trees have been introduced to America by German immigrants in Pennsylvania, the tradition becomes widespread in this year when a woodsman called Mark Carr begins selling trees from Catskills at what will become Mark Carr’s Corner in New York. 1854 – A giant Christmas tree is erected at Crystal Palace. Christmas trees for sale in Covent Garden market pictured in The Illustrated London News. 1914 – On the Western Front in December 1914, small decorated Christmas trees are used as signs of a temporary truce by German soldiers. 1930 – Artificial Christmas trees were made from dyed goose feathers in 19th century Germany, but in 1930 a British-based Addis Housewares Company created the first artificial Christmas tree made from brush bristles. The company used the same machinery that it used to manufacture toilet brushes. (Aluminium foil Christmas trees appear in America in 1958). 1947 – A large Christmas tree is gifted to Britain by the city of Oslo as a token of gratitude for British support to Norway during the Second World War. Given annually, the tree is the central focus of Christmas carol-singing in Trafalgar Square every year.